Calling all my dry skinned friends out there, or even if you are simply on the hunt for a new moisturiser because this is the post for you. While a lot of moisturisers pass through my desk I have selected just five to analyse and am talking you through the good, the bad, my overall experience and whether or not I would recommend. This product promises instant results to active skin cells - helping to reduce the appearance of wrinkles, fine lines and even lift sagging. The bee venom is supposed to boot collagen formation by 300% in 7 days - lifting, plumping and firming. Your skin will be left brighter, firmer and visably younger. While this all sounds great I don't like the sound of "controlling facial muscles for cumulative tightening" and as a plant based eater, I hate using animal products in any way. I used this just once and didn't notice a massive difference but I didn't give it enough time to show true effects. I love how luxe this cream is with beautiful sturdy packaging and all the bells and whistles - even a little spatula to dispense the product. The product itself is extremely rich and creamy so it is quite a heavy moisturiser. This makes the perfect intense night cream when your skin is feeling extremley dry. You can purchase this product here. This is such an unexpected favourite since whitening products have never been a staple in my skincare routine. I love the clean and fresh look that this product provides me with the morning after I use it. It is always good to see a physically noticeable difference after you use products as well as being able to feel how soft and supple it made my skin feel. It is quite a pricey product though and it is difficult to get your hands on miniature sizes to test it out before you buy. The perfect light weight alternative that works to boost hydration in the deeper layers on your skin rather than just the surface. This is great if you love lightweight products because this gel-like product is extremley light on the skin. Don't let it's clear appearance fool you, this stuff holds 1000 times it's weight in water for plumped and hydrated skin. This product is available in many different forms and packages but this is my personal favourite since you press down on the spring loaded top and it dispenses product for you. You can purchase this product here. This product described itself as an Ultimate Defense Illuminating Cream. The mixture combines grape callus with seaweed extract for a potent antioxidant cream. It aims to penetrate the skins deepest layers, locking in moisture and deeply hydrating. This isn't a brand I had heard of prior to using this product but I found the quality to be exceptional and I really enjoyed using it as an effective moisturiser. You can purchase this product here. 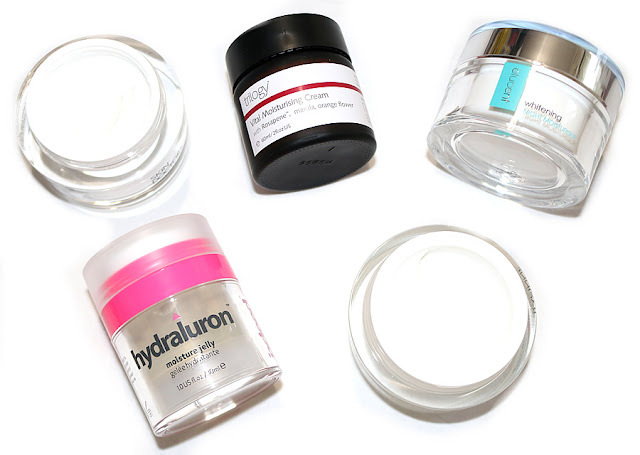 - I would recommend the Hydraluron Jelly if you have combination skin and don't want to disrupt the delicate oil balance since this product immediately soaks in and hydrates from the deeper layers of the skin. - I would recommend the Trilogy Vital Cream for anyone looking for something really intensely hydrating - it isn't their most popular moisturiser for no reason. - The Elucent product is a great option if whitening is a priority for you because it leaves your skin bright and clear.